Gritty and messy, cute and sweet, journey through a gambler's life. 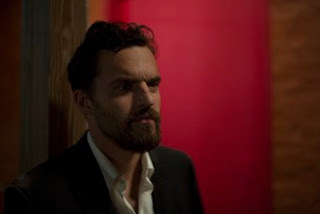 Jake Johnson in Win It All. Courtesy of Netflix. He goes from seedy gambling bars to other seedy gambling bars losing what little money he has, but when he meets with his sponsor (Keegan-Michael Key) he is convinced that he doesn’t have a problem, and he actually wins all the time, he just doesn’t tell his sponsor about those times. And then a friend shows up, the type of friend who asks for illegal favours while he goes away for 6-9 months (depending on his jail sentence, of course). A simple favour, really. Just hold on to this duffel bag for him and don’t let anybody (friends, cops) get it, and don’t look in it, and in return get $10,000 cash. Oh, the dilemma of a gambler, why take a guaranteed ten grand, when you could lose a lot more? We go down the rabbit hole with Eddie. While I didn’t particularly think Eddie deserved to get out of a mess that he created himself, there is something very endearing about Johnson’s Eddie, and you come invested in the direction that his ill-advised adventures will take him. Joe Swanberg, following in the footsteps of his Digging for Fire, turns what seems like a more plot-driven movie into a quiet, understated reflection on life. Eddie meets a girl - a cute, hard-working, single-mother Eva (Aislinn Derbez) – a girl he clearly doesn’t deserve. Whether it’s because of the lack of girls he gets to meet, or just this girl in particular, he takes it slow. He wakes up before noon and starts taking a look at his choices. Win It All is, in many ways, a sweet film. It’s about family and how far people will go to get what they want. It’s a much more dramatic turn than usual for Johnson, but as per usual, he shines in the scenes where he gets to mix understated comedy with flat-out ridiculousness. It’s not as funny as you might expect, but it definitely has its light moments – in fact, most of the movie goes lighter than this type of movie usually does. But it’s still gritty. He trades in the gloriousness of Digging for Fire’s cinematography for a grainier less polished look, for a good reason. On the surface, Johnson’s Tim was living a polished life, but here Eddie is living a very messy life. Win It All is gritty and messy but it does eventually lead somewhere good.